As part of the first stages of the Milwaukee Art Museum’s re-installation, the Lower Level of the Collection is going through some changes. If you haven’t yet done so, go see curator Mel Buchanan and librarian Heather Winter’s 125th anniversary exhibition, which ends with a beautiful rendition of what the Milwaukee Art Museum will look like in the future. 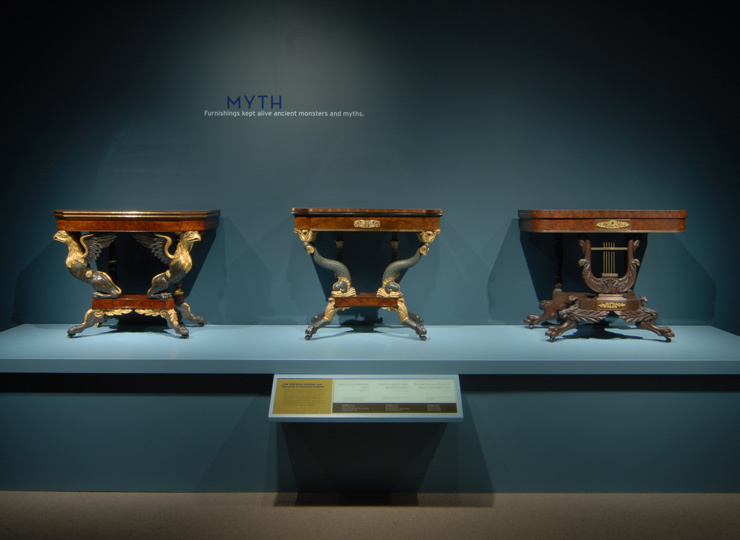 Read on for highlights of Chipstone’s collections in the Museum. Chipstone’s galleries will be de-installed starting on September 17. For those of you that love the Chair Park and the Dave the Potter pot, these will stay up until the end of 2013. So, what does this all mean for you? It means that you should go take a walk through Chipstone’s Cabinet of Curiosities, the Hidden Dimensions Gallery, as well as sit in our round video room before September 17! 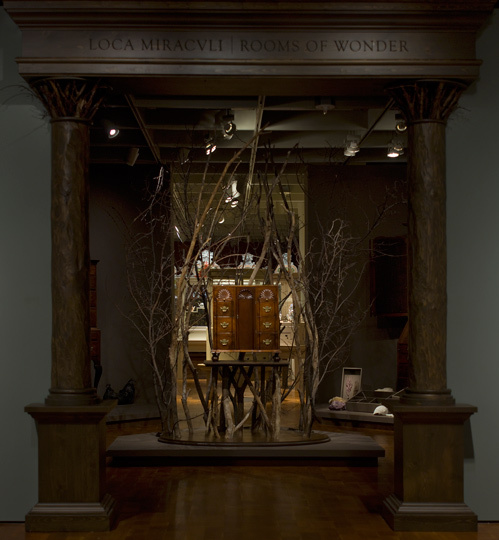 You can experience the three kingdoms in Martha Glowacki’s Loca Miraculi. Try to guess what the connection between the graphite covered taxidermied animals and the Newport high chest is. Spend some time in the ceramics room, opening drawers. Can you find the little babbling grotto? Do you know how agate ware is made (hint: there is a drawer that contains a video of Michelle Erickson explaining the process)? What are some extinct ceramic objects? Next, go into Hidden Dimensions. Ask yourself questions such as: What did a tea table allow the sitters to do (yes, drink tea, but also something naughtier)? Why would an early 19th century banker have a table with Griffins in his home? Why do some 17th century chairs look like gravestones? Finally, take a break in the round video room and watch Randy O’Donnell carve wood, Michelle Erickson throw clay, and Steve Farrell turn and make a face jug. Thank you all for spending time in our galleries, and communicating your thoughts about objects and exhibitions with us! Come visit us at the Chipstone Foundation in Fox Point (open by appointment) or at two exhibitions we are curating at Marquette University’s Haggerty Museum of Art, which will open on January 22. Claudia Mooney works for Chipstone, the Milwaukee-based foundation dedicated to promoting American decorative arts scholarship. She researches objects and creates relevant programming for Chipstone’s exhibitions at the Milwaukee Art Museum and in the community. This entry was posted in Art, Curatorial and tagged Chipstone Foundation, Dave the Potter, Hidden Dimensons, Martha Glowacki. Bookmark the permalink.